After months of rumors in opposition circles of a forthcoming devaluation, and denials of the rumor by Bolivarian government officials, the Venezuelan bolívar was finally devalued ?by 47% on February 8th . 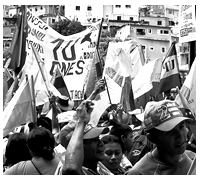 Even though devaluation has become a fairly regular event, especially since currency controls were put in place in 2003, this devaluation has a potentially far greater significance for the future of the Bolivarian Revolution than the previous economic measures and an undeniably greater immediate impact on the base of support for the Bolivarian government. Venezuelan elections are administered by the Consejo Nacional Electoral (CNE) in accordance with the 1999 constitution. The system is electronic, standardized throughout the country and perhaps the most modern and secure in the world. “As a matter of fact, of the 92 elections that we’ve monitored, I would say the election process in Venezuela is the best in the world,” former President Jimmy Carter said last month at The Carter Center. In an extraordinary paper released last week, former US Ambassador to Venezuela, Patrick Duddy, outlined a range of military, financial, and diplomatic measures that the US should be prepared to take against the Chavez government after the coming elections on October 7th.